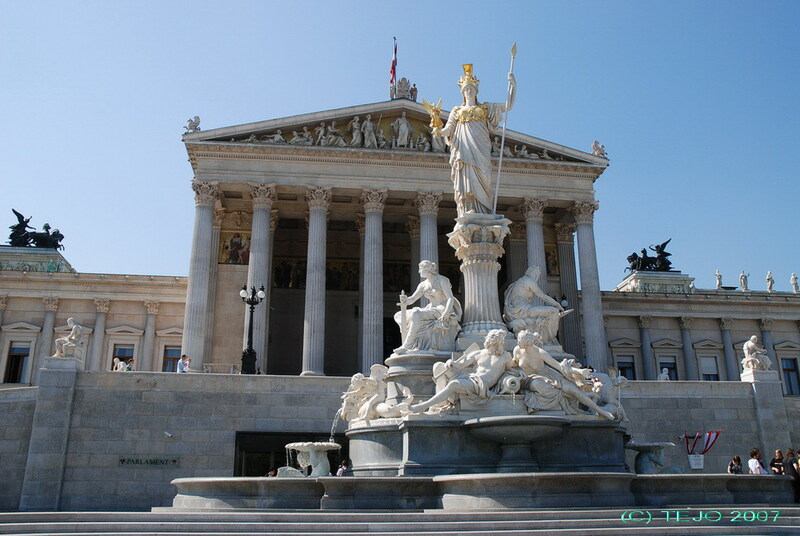 The experience in Vienna in 2004 was a really good one, thanks in no small part to the excellent accommodation chosen. 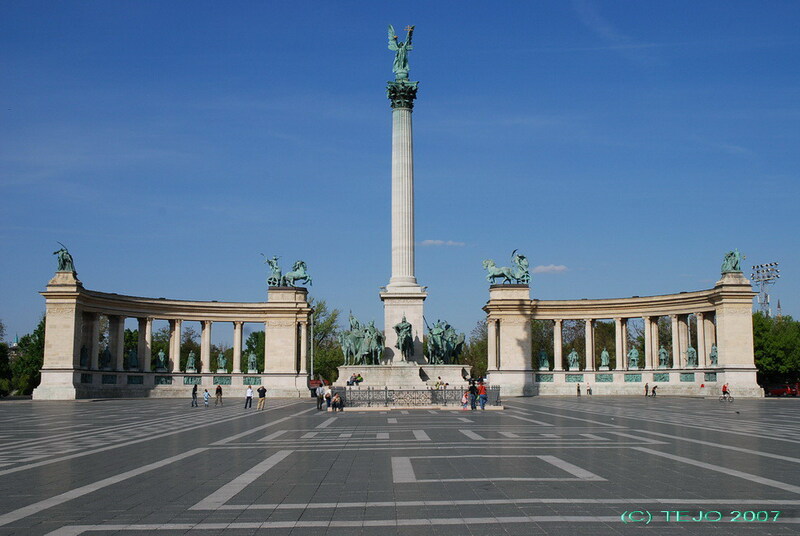 The time had come for a return trip to the capital of the Austrian empire, this time with the intention of combining it with a visit to the Hungarian capital as well - Budapest. Not much of a hassle here, getting a tiny guidebook for Budapest as well as a good city map was mostly what was required - as Vienna was familiar territory already. Perhaps I should include reading the manual for my new DSLR as well as searching for information about photography on various web pages. 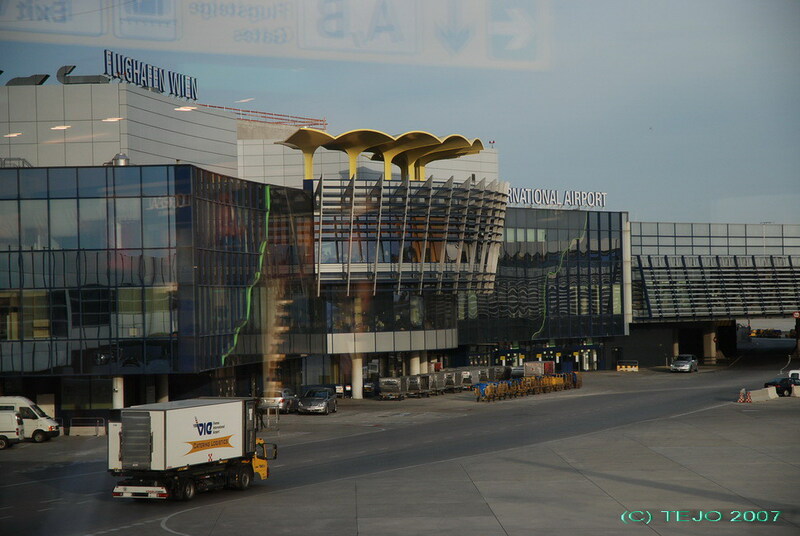 All reservations were made beforehand: airplane tickets with Austrian Airlines, rental car in Vienna, 4 nights at the Austria Trend Hotel Schloss Wilhelminenberg (phew!) 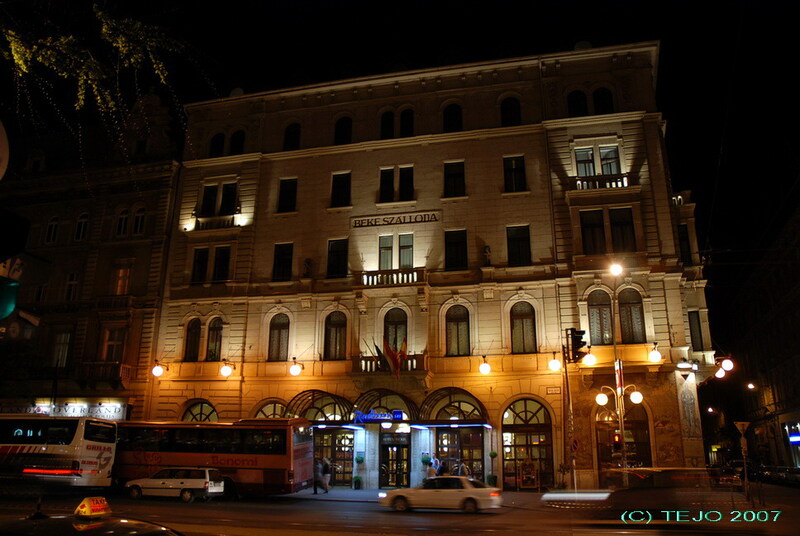 as well as Radisson SAS Beke in Budapest. 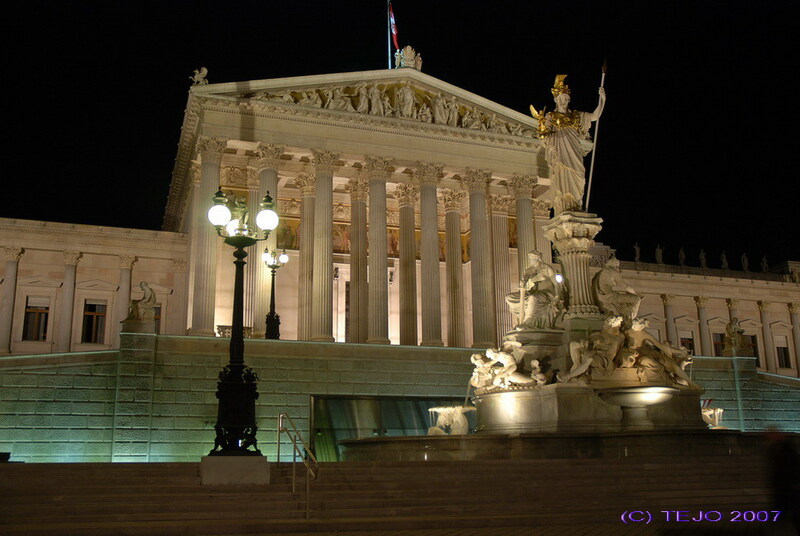 Another reason for going back to Vienna was to visit places that were left out in the 2004 trip. 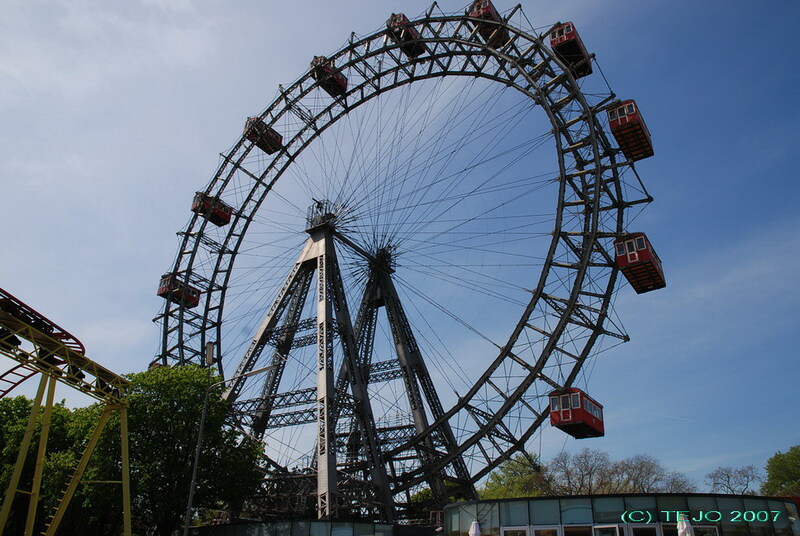 This included the huge Prater park area, with its amusement park as well and the 'Riesenrad' (Ferris wheel), made famous in Carol Reed's 1949 movie 'The Third Man'. A trip with the ferris wheel was on the program, and the view from there was excellent, even though it is 'only' 61 metres tall (exactly 200 feet, having been designed by an englishman). The second Viennese day saw us taking the subway to the Karlsplatz, from where we dropped by the cupola of the cathedral (less impressive than others I must admit), but still with a stylish interior, passing by a huge monument from the time when the soviets liberated the city during the second world war, then down the adjacent street towards Schloss Belvedere. 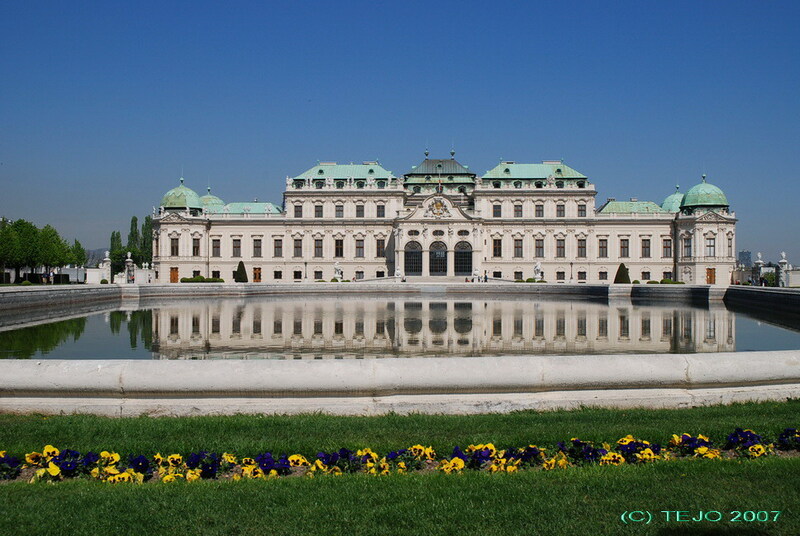 The castle itself is stylish and typical baroque pompous, but usually the gardens are at least as big of a treat as the castle building itself, with well kept lawns and symmetry in four directions (true baroque style). Now however, the entire 'back side' of the castle garden area was under major restoration work (this sounds very familiar...) and wasn't much of a sight. The front side however, seemed to have been given the same treatment, but was finished and thus a very pretty sight. The residence itself used to belong to the Habsburgers, and now houses an art/paintings museum, with famous names such as Gustav Klimt. 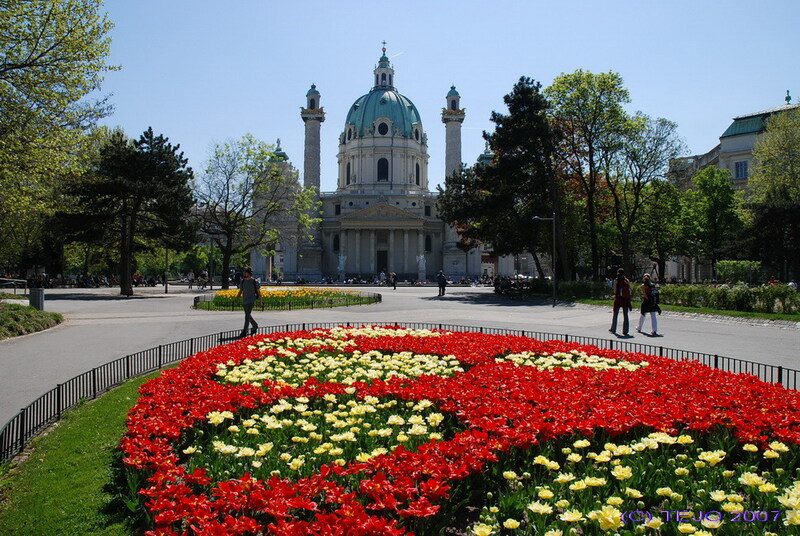 We walked back to the Karlsplatz and up via several parks, like last time to the Neue Burg, and enjoyed lunch in a local place in the nearby park. From here past the Parliament (luckily resembling more of a parliament this time, compared to the walled up hole in the ground in 2004), Rathaus and Burgtheater to the Votivkirche. 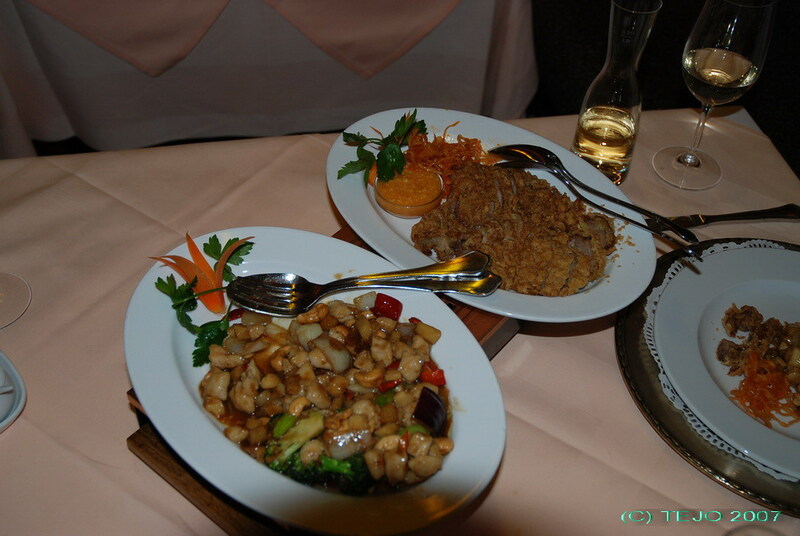 The evening was spent going via the subway towards Leopoldau but hopping out at Alte Donau, for a short walk to the fabulously stylish chinese restaurant 'China Sichuan' (following up the success from 2004). Indeed, the meal was great (a 3-course dinner with wine) although the duck wasn't quite as good as I had hoped, perhaps due to it containing a lot more fat than pure chicken filet. 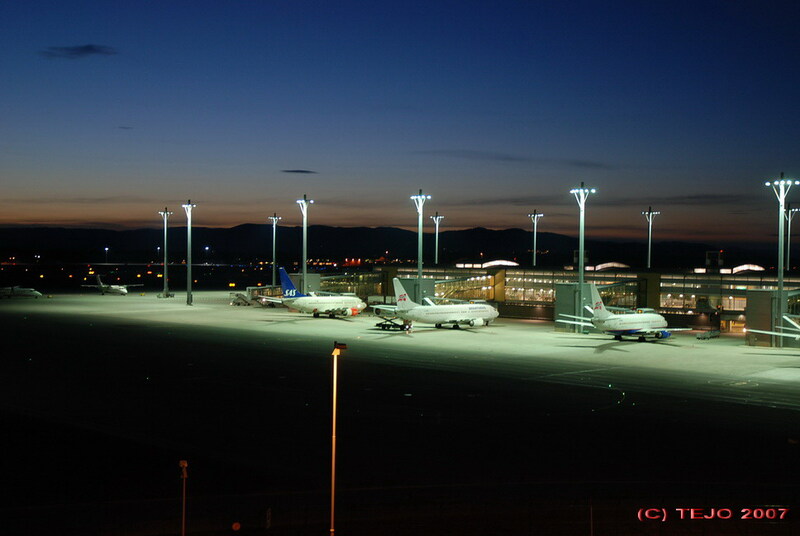 2 1/2 hours later, it was dark outside and the time had come to truly try out the tripod and the DSLR. 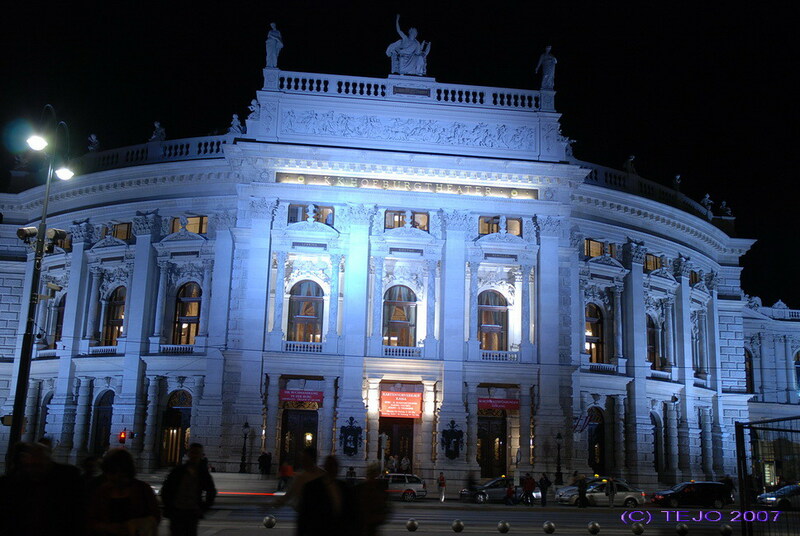 A few shots outside the restaurant, as well as some in the centre of the city of the Parliament, Rathaus and Burgtheater seemed to end up quite successful for a DSLR virgin night-time photographer. The next day was set aside for a walk in the forest area (or Wienerwald). As the morning came, we discovered it had rained quite a bit during the night, and it was still raining, but it subsided somewhat during the morning hours. By the time we left the hotel, there was little rain but a bit cloudy. This would prove to be a day where the Vienna card's free transportation was used to its fullest. After the usual bus route down to Ottakring was complete, it was time to board the SS1 local train bound for Heiligenstadt. This went well, and once there it was impossible to miss the Karl Marx-Hof, a (literally) mile long building complex with small apartments (in true communist style). Leg 3: bus towards Grinzing and Kahlenberg/Leopoldberg. This took quite some time and after passing Grinzing, the bus (or road) wound its way up the hillside until we were at 500 metres above sea level. Instead of taking the (more or less) same route via footpaths downwards to Grinzing, we ended up crossing between the two adjacent hills without being aware of it at first. At the top of the Leopoldberg was a small monastery/church, obviously with some traditions. From here, the path went in sharp curves, steps and steep slopes downwards until it headed for the small village of Kahlenbergdorf. We found out it would be an unnecessarily long walk back to Grinzing, and instead headed over to the shores of Donau, where we walked to Nussdorf, then boarded another SS local train back to Heiligenstadt (thereby sort of completing a round trip), but boarded a bus again for Grinzing and hopped off there to enjoy lunch at a local italian restaurant, where they served a nice (and surprisingly cheap) lunch combo-meal. Grinzing itself is a well known tourist area, and might seem a bit more touristy nowadays than it used to be. It is famous for its 'heuriger', which is the local wine harvest almost fresh from the grapes/barrels. Since this was springtime, it was no time for heuriger. Still, I would say the streets were cosy, with several old-style, low buildings in a row along more or less one main street. After lunch, another 3-leg journey back to the hotel, which brought us to a total of 8 bus/train legs for the day. I decided not to bring my camera along on this trip, partly due to its bulkiness on a walking trip in green surroundings, as well as somewhat unpredictable weather (which actually turned out to be no problem - it got better and better during the day). The trip ended up as a full day trip, so there wasn't much more going on apart from the usual dinner. Vienna was quickly left behind on the motorway, and some 70 km later the border of Hungary was approached (passing close to Slovakia's capital Bratislava as well some 50 km outside Vienna) - a pretty simple border control was performed (it seemed enough to show the outside of our passports), then for the first time - east Europe! Better exchange some euros into forints as well, as euro would probably not be accepted everywhere in the city. The drive through the countryside was pleasant enough, everything was green, and the motorway was of a surprisingly good standard (in fact better than in most countries I have been to, apart from Switzerland). With a 130 km/h speed limit in both countries, it doesn't take very long to cover the 260 kilometres between the two capitals, but add a pleasant lunch with some real native goulash soup, and it will be afternoon before you arrive - and so we found ourselves entering Budapest and aiming for the very centrally located Radisson SAS Beke in the middle of rush hour. Thanks to a good map as well as memorising the route, the hotel was simple enough to find, and it felt good to leave the car in the underground garage rather than above ground in the narrow streets (which were always packed with parked cars anyway). The hotel itself was great, with as high a standard as one can expect from the Radisson SAS chain (part of the Rezidor group), an upgrade to a superior room at a cost of 119 euro per night (breakfast excluded though). The air conditioning was even working properly in the room (I have had various experiences from place to place), and this was a good thing, as the window faced the heavily trafficked (both cars, buses, trams, people and motorcycles) Teréz Körút street - one of the major traffic boulevards in the city. The facade of the hotel is as pompous as many of the buildings in the city - clearly showing similarities from Vienna, thus proving the heritage from the Austria-Hungarian empire. No rest for the dead - with only 1 1/2 day available to cover the (major) sights of the city, we were off towards Heroes' Square at first - a good 2 kilometre walk. The square was quite big and impressive, with the massive monument dominating the far end. 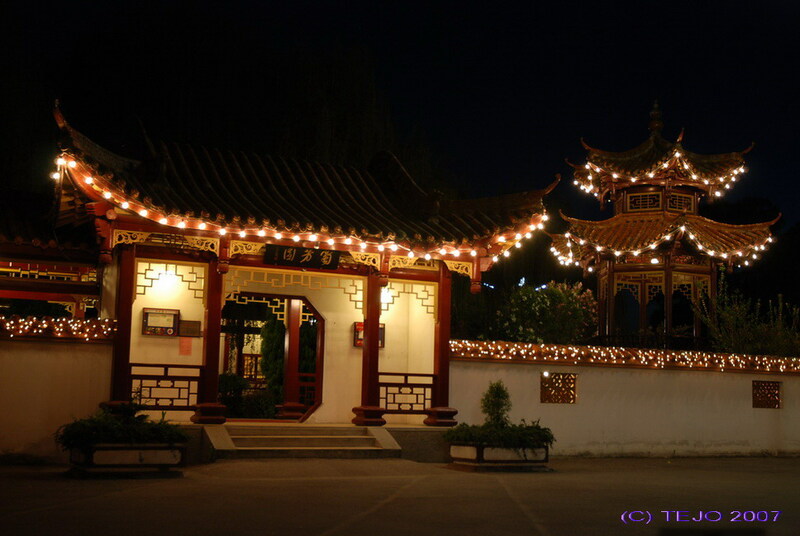 It has statues of the leaders of the seven tribes that formed the nation in the 9th century as well as some other famous characters up through the centuries. Construction of the monument was from 1896 to 1929. 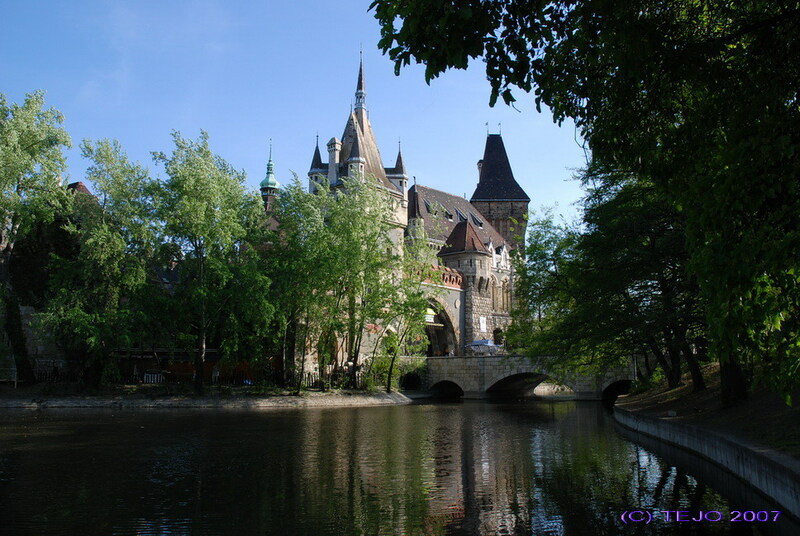 - Vajdahunyad castle, a smaller replica of an impressive castle that hungarians originally build in Hunedoara, Transilvania, Romania. The road back towards the hotel was a different one from the narrow one we chose to the park - Andrassy Avenue, covered with embassies as well as the State Opera. Dinner? Hmm..we found a very small take-away-or-eat-here chinese style cafe where food was pre-prepared and on display at the counter. Good enough, and extremely cheap, although with a bit of language problems. 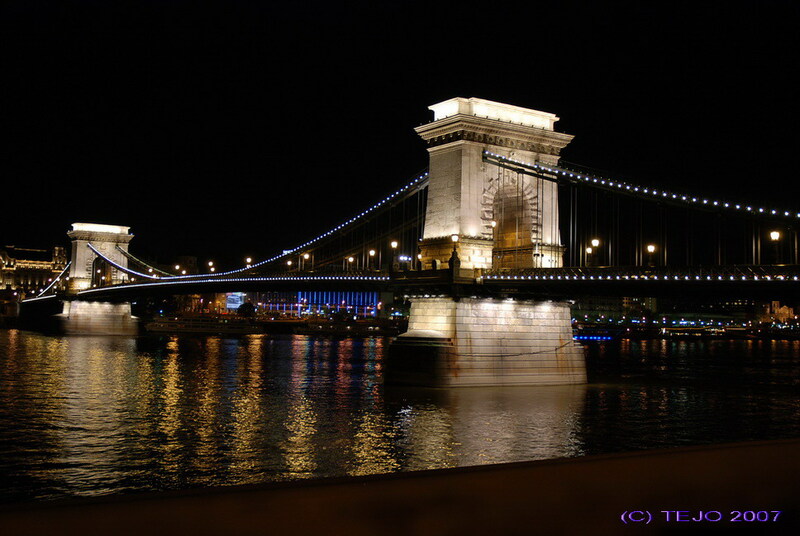 In the evening it was time for yet another walk - this time to capture the night images of the most famous sights of the city - Buda Castle and Chain Bridge. Again, the virgin photographer considers himself relatively successful (it did take more than one try though). 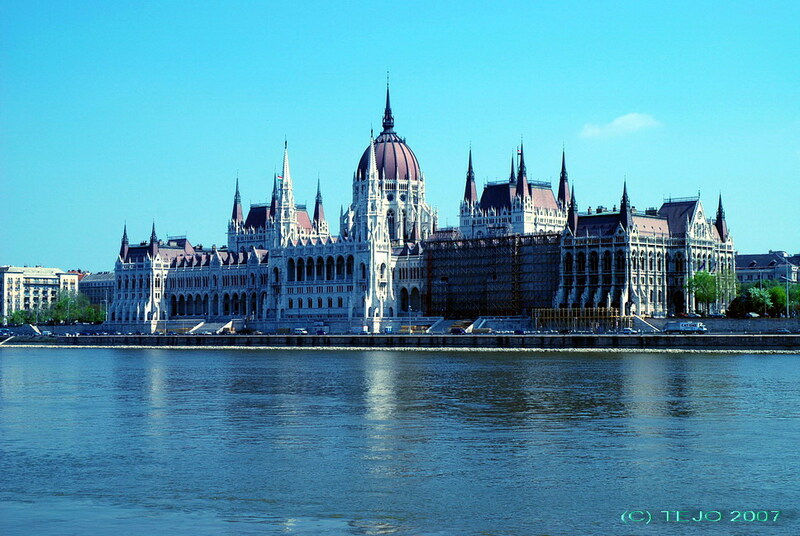 Budapest was originally a split city more than a thousand years ago. Obuda, Pest and Buda were separate and grew independently of each other, until late in the 19th century when the 'newer' part Pest grew so much it encompassed the other two parts, and was declared as one city in 1867. Today, it houses some 1.9 million people out of the country's total of 10.3 million. While the 'new' city contains several interesting landmarks, some of the more interesting sights (and viewpoints) are from the hillside along Buda castle. Walking towards the main part of Donau, one is mostly bound to pass by the large St Stephens' (István in Hungarian) cathedral. This one was brilliantly refurbished, and a trip to the roof was rewarded with great views of the city in every direction. The cathedral also houses a somewhat gross relic, namely the mummified hand of St Stephen (István), who was the first king of Hungary roughly 1000 years ago. Coming further south, one of the major landmarks is the chain bridge (Széchenyi lánchíd). In 1849, it was the city's first permanent bridge across the river. It was considered both a major feat of engineering as well as being a beautifully designed bridge - but the true beauty of the bridge is only seen in the evening - more of this later. Directly behind the bridge lies Roosevelt Square, dominated on one side by the impressive Gresham Palace which now houses The Four Seasons Hotel Gresham. On the other side of the bridge is another square (heavily trafficked roundabout) and the bottom station of the Buda Hill funicilar. 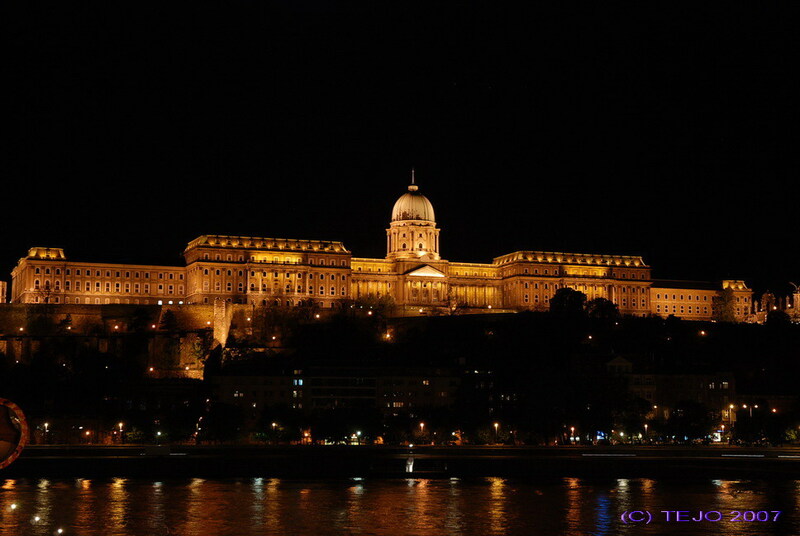 Opened in 1870, it takes only a couple of minutes to climb the hill to Buda Castle. From here, the view over the new town of Pest is excellent, the major landmarks being the chain bridge and Parliament buildings, the latter being one of the biggest and most impressive in Europe, with a length of 268 metres. 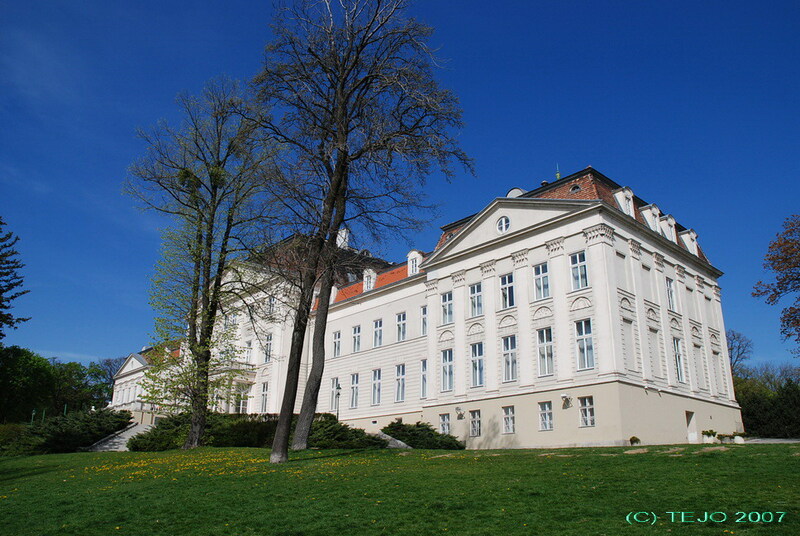 The first castle on the hill was build in the middle of the 13th century, while the oldest parts of the current castle dates from the 14th century, while most of its current appearance dates from both the later Habsburg area as well as the mid-19th century, following a siege and burnout. It was again heavily damaged in the end of the second world war, yet the medieval fortifications were masterfully restored after this. The palace interiors suffered a different fate though, as the newly formed communist regime decided to destroy most of it, leaving little of interest. The palace interior was not visited, but lunch was enjoyed (expensive goulash soup!) in the pleasant spring weather at the Sissy restaurant (named after empress Elizabeth of the Habsburg empire). 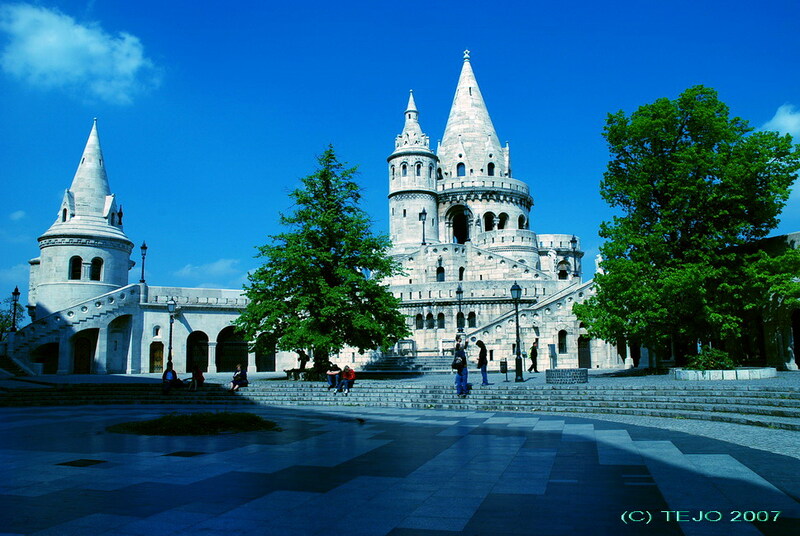 The other two major attractions atop the castle hill, in addition to the pleasant car-free medieval surroundings, are the Mathias church (closed due to renovation..surprise surprise) and the Fisherman's Bastion (Halászbástya). 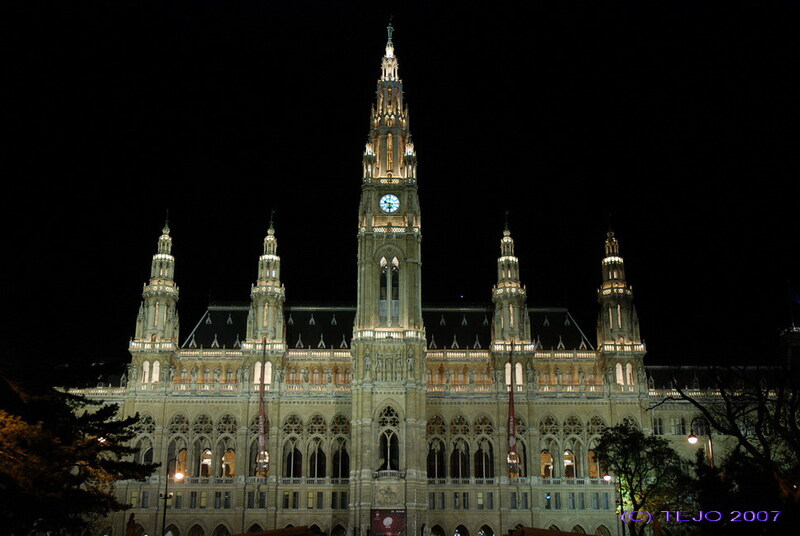 It was built between 1895 and 1902, and comprises seven towers representing (again) the seven Magyar tribes founding the city in 896. Its name and place derives from the guild of fishermen which defended the city walls during the middle ages. The plane left at 19:50...yawn, and the luggage handlers seemed to consider two identical hand luggage bags were different - one would fit in, the other wouldn't. Who said logic exists everywhere?